Thrombolytic therapy is the use of drugs to break up or dissolve blood clots, which are the main cause of both heart attacks and stroke. Thrombolytic medicines are approved for the emergency treatment of stroke and heart attack. The most commonly used drug for thrombolytic therapy is tissue plasminogen activator (tPA), but other drugs can do the same thing. Ideally, you should receive thrombolytic medicines within the first 30 minutes after arriving at the hospital for treatment. Learn about blood clot and embolus formation, including how they form and health risks associated with them. 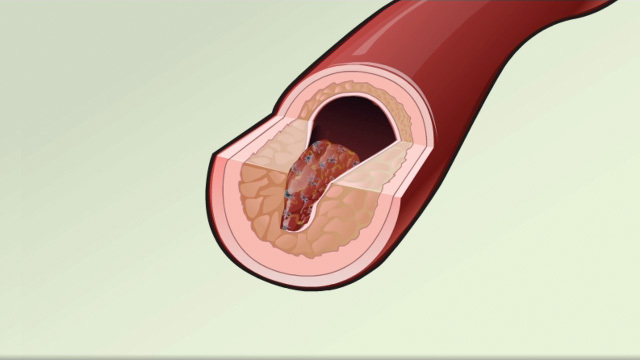 A blood clot can block the arteries to the heart. This can cause a heart attack, when part of the heart muscle dies due to a lack of oxygen being delivered by the blood. Thrombolytics work by dissolving a major clot quickly. This helps restart blood flow to the heart and helps prevent damage to the heart muscle. Thrombolytics can stop a heart attack that would otherwise be larger or potentially deadly. Outcomes are better if you receive a thrombolytic drug within 12 hours after the heart attack starts. The drug restores some blood flow to the heart in most people. However, the blood flow may not be completely normal and there may still be a small amount of muscle damaged. Further therapy, such as cardiac catheterization with angioplasty and stenting, may be needed. Your health care provider will base the decisions about whether to give you a thrombolytic medicine for a heart attack on many factors. These factors include your history of chest pain and the results of an ECG test. Most strokes are caused when blood clots move to a blood vessel in the brain and block blood flow to that area. For such strokes (ischemic strokes), thrombolytics can be used to help dissolve the clot quickly. Giving thrombolytics within 3 hours of the first stroke symptoms can help limit stroke damage and disability. As in heart attacks, a clot-dissolving drug isn't usually given if you have one of the other medical problems listed above. Thrombolytics are not given to someone who is having a stroke that involves bleeding in the brain. They could worsen the stroke by causing increased bleeding. Bleeding is the most common risk. It can be life threatening. Minor bleeding from the gums or nose can occur in approximately 25% of people who receive the drug. Bleeding into the brain occurs approximately 1% of the time. This risk is the same for both stroke and heart attack patients. Heart attacks and strokes are medical emergencies. The sooner treatment with thrombolytics begins, the better the chance for a good outcome. Anderson JL. ST segment elevation acute myocardial infarction and complications of myocardial infarction. In: Goldman L, Schafer AI, eds. Goldman's Cecil Medicine. 25th ed. Philadelphia, PA: Elsevier Saunders; 2016:chap 73. Goldstein LB. Ischemic cerebrovascular disease. In: Goldman L, Schafer AI, eds. Goldman's Cecil Medicine. 25th ed. Philadelphia, PA: Elsevier Saunders; 2016:chap 407. Mega JL, Morrow DA. ST-segment elevation myocardial infarction: management. In: Bonow RO, Mann DL, Zipes DP, Libby P, Braunwald E, eds. Braunwald's Heart Disease: A Textbook of Cardiovascular Medicine. 10th ed. Philadelphia, PA: Elsevier Saunders; 2015:chap 52.